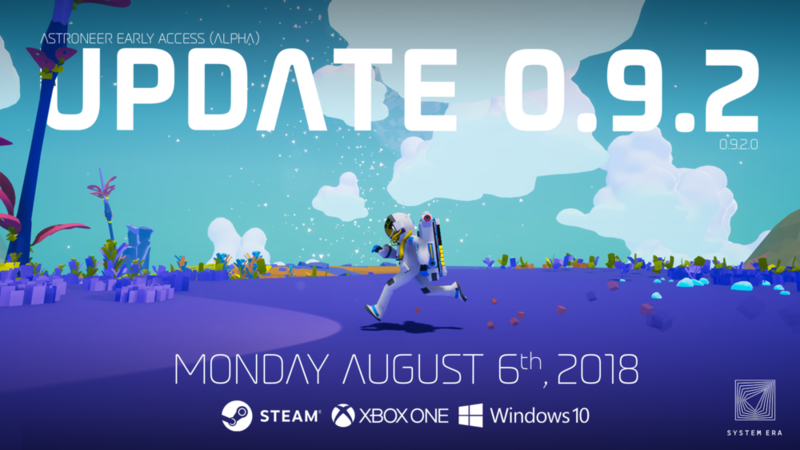 Steam 'Early Access' players will receive this update today, August 6th, 2018. Xbox 'Play Anywhere' players can also expect this patch to hit their consoles or Windows 10 machines throughout the day August 6th , 2018. Update 0.9.2 contains the groundwork for extensive changes to the crafting and resource systems, as well as additions to printer lists and changes to printers overall! You can find these updates in 0.9.2.0, the current build of the game. New resource deposits have been added to the solar system! Titanite, Wolframite, and Hematite deposits can now be found on the surface of planets and in caves. But you won’t be able to find all of these on Terran, intrepid Astroneers will have to travel the solar system in order to find the new resources. Titanium has been changed to be the refined form of Titanite. Wolframite and Hematite can be smelted into Tungsten and Iron, respectively. - Medium Printer has been removed as part of an ongoing effort to streamline crafting. With the introduction of the Small and Medium Fabricators, the Medium Printer became increasingly redundant and created confusion about where objects can be crafted. Existing Medium Printers in saved games have been automatically converted to Small Fabricators. - Thruster is now a craftable object. It is available in the Catalog for 2000 Bytes and prints from the Small Fabricator for 2 Tungsten. - The respawn rate of Harvestables has been positively adjusted! 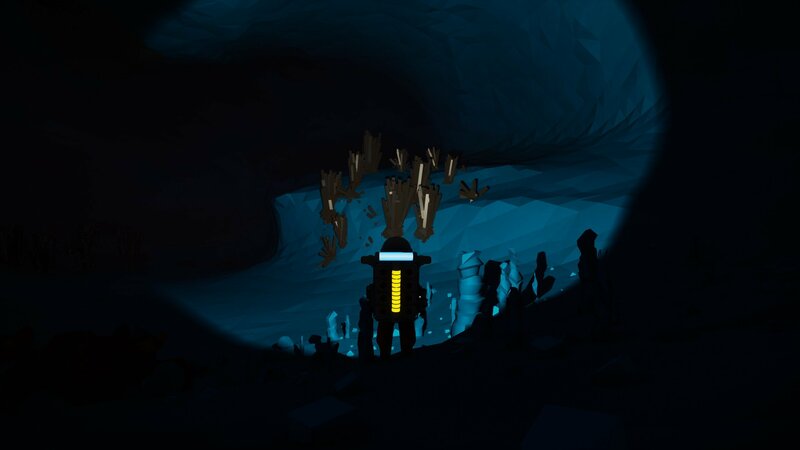 - EXO wrecks can now be found in caves! Adventurous Astroneers will also discover new large wrecks on the surface that hint to each planet’s theme. - The orange launch button has been removed from the Shuttles. You can now use the Auxiliary keys (Z / X on keyboard or RB / LB on gamepad) to launch into orbit. - Beacons have received a small update and a bug fix. Beacons are once again visible when slotted. Now players actually can locate their vehicles if a beacon has been put in a slot on the chassis. They can now be turned off. This option is available when you finish cycling through all of the color options using the input keys. They can now be turned on, off, and their color can be changed using the aux keys when slotted onto an auxiliary slot on vehicles and backpacks. A number of frequently occurring low-level crashes have been fixed, increasing overall stability. [AS-2475] - Fix an issue where the Backpack "No power” notification did not account for attached extra power from batteries. 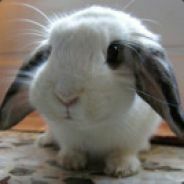 [AS-2521] - Fixed an issue in Multiplayer games where an incorrect required resource notification is displayed when a Client player scrolls between craftable objects with a resource in their backpack. [AS-2576] - Picking up or quick stowing a bundleable item into the Backpack no longer starts a new bundle if a non-full bundle of that item is already in the backpack. 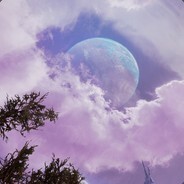 [AS-2598] - Fixed a Multiplayer issue where the Backpack printer did not display necessary resource to craft for the Client player. [AS-3256] - If you open the catalog while your terrain tool is out, it will be put away. This fixed an issue where the mouse did not work with the catalog if the catalog was opened while the terrain tool was equipped. [AS-3261] - Fixed an issue where Medium Generators attached to a Rover aux slot could not be toggled using the aux keys. [AS-3267] - Fixed an issue in the Tutorial, where the Research Module control panel could not be examined when the progress tooltip refreshed too quickly. [AS-3294] - Fixed an Audio issue causing the reverb audio filter to persist when Players exited a cave. [AS-3311] - Fixed a small visual issue where the Trade Module Rocket appeared unskinned for a brief moment when the Trade Module platform is unpacked. [AS-3331] - Spiker Seeds now have a UI card. [AS-3339] - Client players should once again be able to slot items to the top slots on the Medium and Large Rovers. [AS-3349] - Fixed an issue on the Xbox One where the selection cursor persisted upon respawn if the Astroneer died while browsing the catalog. 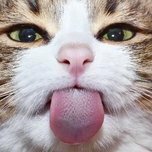 [AS-3382] - Drop SFX have been restored on small modules. [AS-3383] - Pick-up and placement SFX for Small Wind Turbine, Small Solar, and Small Generator have been restored. [AS-3389] - Clients should once again hear Fuel Canister emptying SFX. [AS-3396] - Vehicle Bays should now be able to print Rovers and the Small Shuttle on top of a wrecked Spaceport. [AS-3424] - Blowing up a Large Shredder should no longer leave an unusable partial Scrap resource. [AS-3430] - When modules are picked up from their bases, their control panels will now close automatically instead of jittering erratically. [AS-3463] - Tweaked the Fireworks sound effect so it no longer starts before the visual effect appears. Fixed a number of small localization bugs, naming inconsistencies, and text spacing issues. Restored a number of missing icons indicating the contents of a printed package. The addition of new Wrecks and Discovery types will cause terrain seams in old saves. This will no longer be an issue once Terrain 2.0 gets rolled out! Some titanium from older saves might disappear upon updating. Thanks for reading! Can't wait to see you all at PAX in a few weeks to talk about some really exciting news related to Terrain 2.0! Confusing....the post date is July 19, but the title says August 6. Can Joe see the future? July 19th is when he started the patch notes post. He then saved it as a draft and added/edited it as needed. It was submitted today when the patch was complete. Will we ever be able to pack stuff back up after we unpack it? Because the whole unpacking process seems rather pointless when they can't be packed up again. Since the boxes won't attach to the vehicle mounted storage units, it's not possible to transport them prior to unpacking anyway which means the whole process is just an unnecessary extra step. Will we ever be able to pack stuff back up after we unpack it? Would like the ability to switch off the long press. alt and ctrl click work as "insta click" substitutes. Can I bind to a single key? EDIT: Also, not working with the "examine" action? Wow!!! The "political correctness" in this release notes is almost sickening. "new recipes!" How about 4 changes recipes and 1 new. "Streamline crafting" by removing a well tested and accepted tool, the printer? "The respawn rate of Harvestables has been positively adju﻿sted!" that one just scares me, but I'll try to remain positive... Exo wrecks in caves still bugs me, as these are orbital items, how do they get underground? And removing the launch button is not good, no matter how you try to mix it. I'd bet the majority of players are PC based, not console. Open to correction, but SES seems head strong on pushing consoles more than the majority of players use, making it harder for PC players to play. Not a good business model. Tough love SES. Tough love. If you can't see it, your hardware doesn't support it. This is either due to not meeting the recommended specifications or driver issues. I've tried the game on a controller . . . to be honest, it still feels out of place. It's not something other games do. If I'm playing Zelda: Breath of the Wild on my Nintendo Switch, I don't need to long press to mount my horse - I just tap the A button and my character climbs right on. It's kinda weird to hear people say this is a console thing when the games I play on consoles don't do it. I've actually expressed my thoughts on the controls in another thread. I know there has been a lot of iteration on the controls, but it seems the reasoning behind the latest controls (especially the long press) is rather unclear. Which is kinda strange because System Era is usually pretty transparent. It would be very nice if long pressing the buttons was made optional or if you were given the ability to rebind the instant actions. I'm on a PC, we already have key rebinding, I think it's okay if I can just customize my game so I can just press the E key and be done with it. I don't see the problem with that. Terrain 2.0 and a December release is less than 5 months away. Just be patient. I really liked the hoverbuttons much more than the current sticky button implementation. Oh well.